I am enjoying this canvas project, but I tend to let it sit quite awhile before I add to it. The birdcage is a diecut I bought awhile ago. It has several coats of decoupage paste on it because I had planned to use it as a stencil with one of my GelliArts™ printing plates. The photo transfer is of my granddaughter - somehow she sneaks in to most of my projects and doesn't even know it! This canvas has lots of textures created from background pages, corrugated cardboard and embossed cardstock. I really love the way this is going but need to add some more paint to the top of it.....it looks maybe a bit too "contrived" right now. OH! I also used a cute little brad on the birdcage from an older collection by Teresa Collins Designs which has the word "FREE." Most of my work lately has been in small journals. I'll post some of them soon. 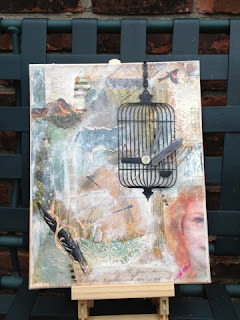 Next week, my friend Grace and I are attending CREATE Mixed Media Retreat in the Chicago area. She attended last year and loved it. I'm soooo excited to attend --- one of my favorite things is to immerse myself completely with little other distractions in my ever-changing, ever-expanding art.